On Tuesday morning, a crowd of sixty parents, students, teachers and community members gathered in front of PSP Capital Partners, the private equity firm owned and managed by billionaire Chicago Board of Education member Penny Pritzker, to make the case that raising the minimum wage in Illinois would lead to better academic outcomes for CPS students. The coalition of community organizations sponsoring the press conference—including the Chicago Teachers Union (CTU), Albany Park Neighborhood Council, City Colleges of Chicago American Federation of Teachers (AFT) Local 1600, Arise Chicago and Stand Up! Chicago—called on Pritzker to sign a statement pledging to invest in the middle class and the future of our children by supporting a raise in the Illinois minimum wage. The current Illinois minimum wage of $8.25 an hour amounts to around $17,000 annually, which for a single parent working full time falls below the federal poverty guidelines. 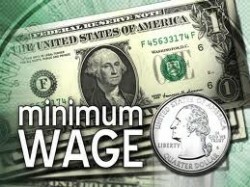 Families with two minimum wage earners also fall dangerously close to the poverty level. CPS is home to over 100,000 students living at or below the poverty line. The coalition of community groups held the press conference outside of Chicago Board of Education member Penny Pritzker’s private equity firm, calling on Pritzker to sign a statement in support of SB 1565, proposed legislation that would raise the Illinois minimum wage to $10.65 an hour by 2014 and peg it to inflation thereafter.